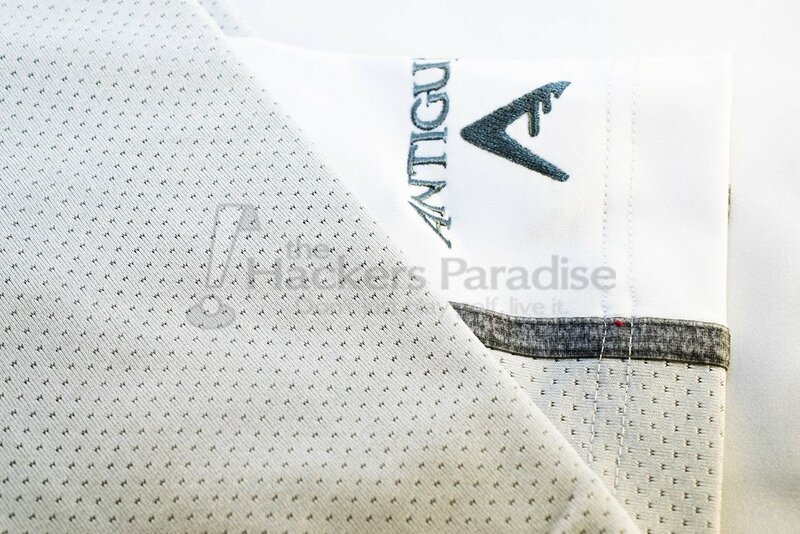 Antigua might not be the first brand name that comes to mind when one is looking for golf apparel. However, take a look throughout many pro shops around the country and there is a good chance there will be an Antigua polo embroidered with the course’s name or logo. As a company, they have built one of the top embroidery businesses in the golf industry, which all started with just one machine. Antigua provided THP the opportunity to get a closer look by sending in three different items that are featured in their Spring 2017 catalog. 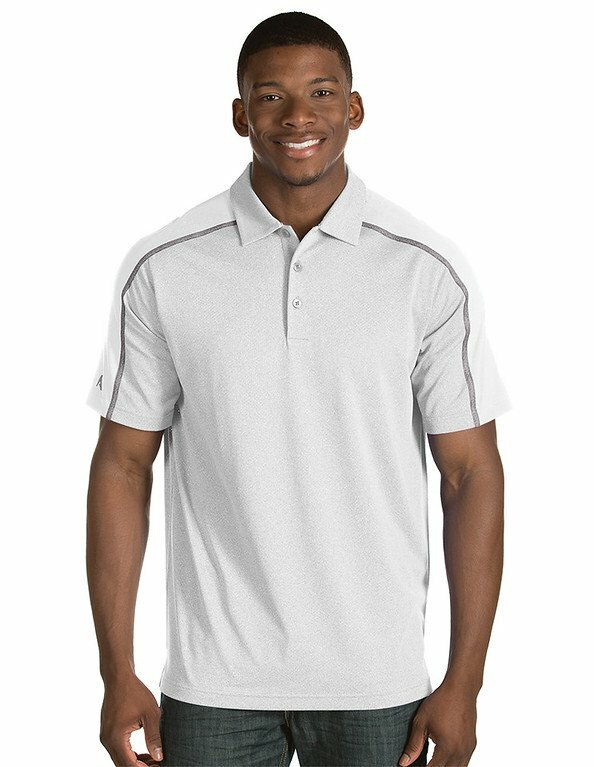 94% micro polyester/6% spandex Desert DryTM moisture wicking solid pique men’s polo with self-fabric collar. 3 button topset placket & folded hem cuff detail. 3D silver reflective A logo. With all of the many styles of polos that are on the market, one can never have a shortage of solid-colored golf shirts, and that is where the Endure comes in. In fact, the Endure has everything needed and/or expected to become that go-to shirt. Going off of looks alone, the Endure appears to be a no-frills polo thanks to its mono colored design, however, it’s what Antigua has engineered in this polo that helps make it a really good option for the course. Piqued polos are really nothing new, but what Antigua has done is start from scratch in terms of the build, in what they are referring to as “Perfected Pique.” By introducing a spandex polyester weave, the Endure has become a lightweight, moisture wicking top, that also utilizes a four-way stretch pattern. 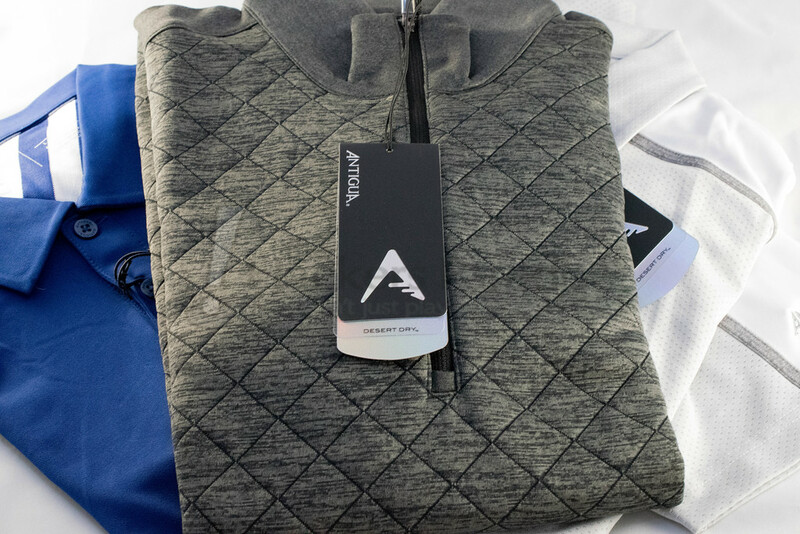 For the golfer this means a shirt that will be able to comfortably survive a round of golf, handle all of the heat and perspiration, as well as a fabric that will move with the golfer instead of grabbing or hindering the swing in any fashion. Solid color polos never get old, and by coming in nine different color options, the Endure can become one incredibly versatile top. This simple and tasteful polo can be found for $65. 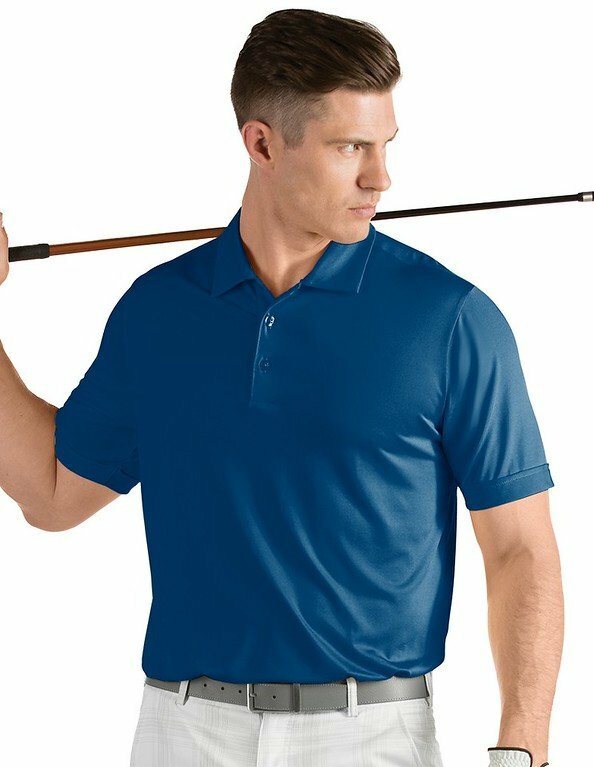 92% polyester/8% spandex Desert DryTM moisture wicking pointelle heather mesh polo with solid jersey sleeve insets & contrast heather taping at inset seams. Self-fabric heather collar, 3 button placket & open cuff. 3D silver reflective A logo. While not exactly the type of polo that one might think of for a spring design, the Sustain offers a nice lightweight feel with plenty of ventilation. The reason for thinking this does not exactly fit into a classic spring release is for the mesh design that takes up the entire back, chest, and under arm region. A spandex blend is featured both across the shoulders and the top half of each sleeve, which continues with the lightweight design in a contrasting color. Just like with the Endure, there are a wide variety of color options offered here. Each color has some gray or heather piping that separates the two individual areas of this shirt. That design works really well with some of the darker or more vibrant colors, however the white heather polo that was received does not offer the distinction in color variations that the other options afford. Nonetheless, the Sustain is a quality shirt for those hot days thanks to the combination of the mesh pattern and Desert Dry technology. Those looking to purchase this polo can do so for a price of $70. 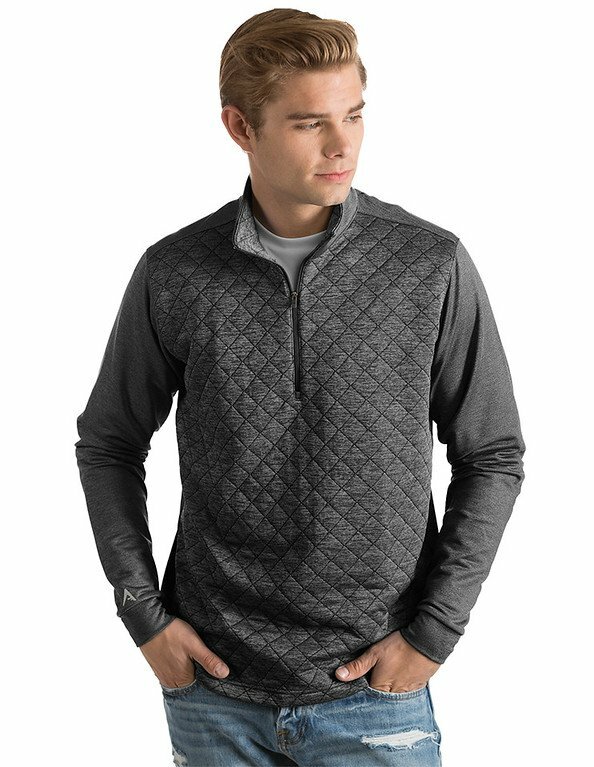 100% polyester Desert DryTM moisture wicking heather 1/4 zip pullover with diamond quilted front panel and 93% polyester/7% spandex heather jersey with texture back sleeves & collar. Cut & sew cuff. Stand up collar & open bottom. 3D silver reflective A logo. Being a fan of ¼ zip golf shirts, the Arctic Pullover was an immediate hit and proved to be a great option for some spring weather golf in the northeast. This pullover body consists of 100% polyester which sports Antigua’s Desert Dry fabric that is seen in their polos, while there is more of a polyester spandex blend on the sleeves and collar. In terms of weight it really does well to hit that happy-medium point, where it is light enough to wear over a polo without hampering the swing, but yet maintaining a thickness that makes golfing in cooler temperatures a more pleasant experience. Not only was this pullover comfortable to slip on for a round of golf, but it was also quite fashionable with the diamond designs on the front chest area. This type of design made is a perfect option to take from work to the course. With the many golf leagues that take place after the work day is done, golfers can certainly appreciate this kind of versatility. It is currently available in six different color options, with black heather being the selection that arrived for review. 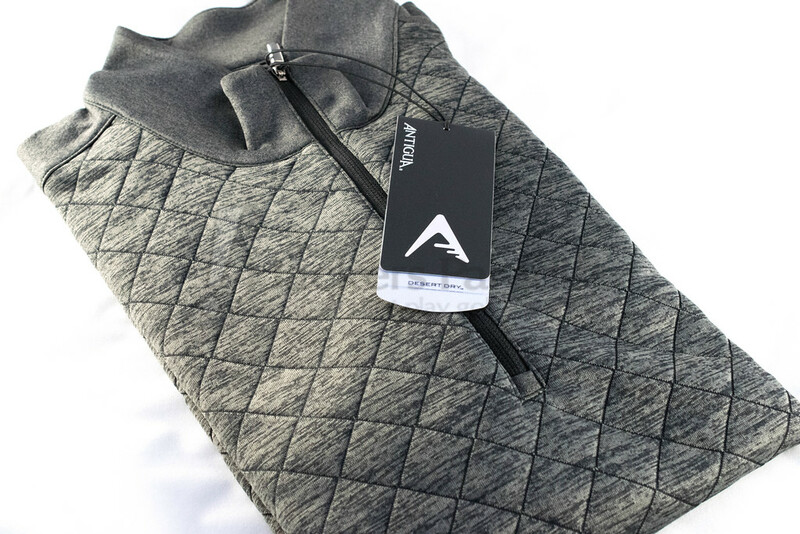 Sizes for the Arctic Pullover range from medium to 2XL, while coming in at a price tag of $83. One thing to note is how evolved the Antigua brand has come, not just in style, but in fit as well. It wasn’t all that long ago that consumers needed to be mindful of their size, and most of the time order down a size. That is not the case anymore as the pieces from the 2017 Spring line proved to fit true to size. Throughout their spring lineup, golfers surely will be able to find an offering that will match just about any style out there, as there is a nice selection of solids, stripes, and more technical polos like the Sustain, in an abundance of color options. To get a look at the other pieces featured in the Spring 2017 lineup, head over to www.antigua.com. Nice review Dean. I have antigua stuff and they make a good product. The 1/4 zip is my favorite. I know you said the fit is true sizing, the sustain and endure look like different fits, are they? Pricing is similar to major brands – so I don’t know how I feel about that as Antigua doesn’t move the needle for me as a name. I really like that 1/4 zip – that’s something I’d wear on or off the course. Antigua is a brand I don’t think I have anything from, but whenever I’ve seen their stuff I’ve liked it. The endure looks like something I’d be happy having a closet full of. That grey 1/4 is sharp!! !